Wetherby Athletic are finally starting to see their efforts to re-build the club pay off on the pitch. 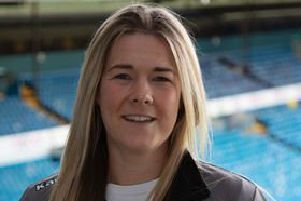 Following relegation from the West Yorkshire Premier Division in 2017, the Leeds side looked in big trouble after just their second season in Division One, but a run of one defeat in their last seven league games has given them real hope of survival. Chairman Mike Robinson said: “The club is in a rebuilding situation at the moment, a lot has gone on in the past. I’d like to give special mention to Matt Barnfather, our manager, and his assistant Mick O’Toole. The new-look management duo of Barnfather and O’Toole has, in Robinson’s view, created an incredible team spirit at the club which has seen the squad play and support each other at a phenomenal level. He said: “All the players who have come in are buying into the situation. “There is such a fantastic team spirit that even those who don’t make the team come and support us on the sidelines. “What that support creates is fantastic. I can’t thank them enough for that. That spirit has carried us into getting results that, on paper, we shouldn’t have got. Some of the teams have been better than us on paper, but the boys battle from the first to the 90th minute and it is marvellous. “The players all turn up for training, they are in it for the long haul and all of them have said they’re coming back next season. “We have so many players interested that we may be able to field a second team next season. “That squad depth would absolutely give us a shot at promotion next season. It was a difficult start to the campaign for Wetherby who won only one of their opening 11 league games. But, if it wasn’t for some special helpers, their season may have ended far differently from their current revival efforts. “If we’d had this squad at the beginning of the season, we would have done a lot better. But that’s not detrimental, because the veterans’ team helped us out in the early games,” said Robinson. With several games in-hand over those around them, Wetherby had the weekend off to watch the results unfold. Pool picked up a vital win in their own relegation fight, seeing off Otley Town 7-4 in the Wharfedale derby. Josh Wagstaff was the star of the show, netting four times for the victorious hosts. Leeds Modernians were defeated 1-0 by Oxenhope Recreation thanks to Scott Nelson’s first-half goal, while Featherstone Colliery suffered a 3-1 defeat to high-flying Boroughbridge. Chris Simpson netted all three for the visitors. Howden Clough are now trying to keep their campaign respectable, but a 5-0 loss to Hartshead didn’t help matters for the side well adrift at the bottom. At the other end of the table, Hall Green United secured a crucial 3-1 victory over title-rivals Aberford Albion, while Kirk Deighton Rangers kept their name in the conversation with a 2-0 win over Kippax. Newsome’s 4-2 victory at East End Park means their hopes of back-to-back promotions remain very much a possibility for the season. Premier Division leaders Carlton Athletic proved they are human after they dropped points in a 1-1 draw at Horbury Town, writes JAMIE WOODHOUSE. Anees Younis came up with a 90th-minute equaliser for the visitors, a goal which kept them at the summit with a one-point margin after Beeston St Anthony’s claimed a 5-0 win at Field. Leeds City were also victorious, running out 3-0 winners at neighbours Headingley. Adam Fowler found the goal again after 31 minutes, with Ash Walker and Adam Dutson securing the three points after half-time. That win puts them seven points behind Carlton, meaning their title challenge isn’t over just yet. Ilkley Town and Hunslet, who have been trading that best-of-the-rest fourth spot for weeks now, finally met at the weekend, and it was Ilkley who emerged with the spoils. Toby Harris and Tom Smith struck for the visitors, and with the gap to Leeds in third standing at four points, Ilkley may not be finished yet. Tendai Machama earned a surprise 2-1 win for Knaresborough Town Reserves at Whitkirk Wanderers, while hat-tricks for Regan Fish and Dan Middleton secured a 6-1 victory for Sherburn White Rose at Wyke Wanderers. Rawdon Old Boys remain at risk of relegation after their 3-2 loss to Huddersfield Amateur. With Campion Reserves’ home game against Knaresborough Celtic postponed, Glasshoughton Rock returned to the top of Division Two after their 4-0 defeat of Altofts. Richard Kingsbury struck twice, with James Earley and Liam Kellett also on target. Shelley Reserves remain in the promotion hunt after they beat Kellingley Welfare 3-0, as do Huddersfield YM who picked up a 3-1 victory over Tingley Athletic. Brighouse Old Boys picked up a rare win, defeating Hunsworth 2-1 to complete the weekend action. Golcar United moved a step closer to the West Riding County Amateur League title with a 4-0 win over lowly Lepton Highlanders, writes THOMAS RITCHIE. A Buddy Cox brace and strikes from Alex Hallam and Ryan John saw Golcar race into a four-goal half-time lead before seeing out the second half comfortably to secure the three points. Golcar sit four points clear of TVR United with a game in hand, with TVR having just three games remaining. Lepton Highlanders remain bottom with just two wins and seven points from their 19 games, three points adrift of second-bottom PFC. Defeat for Toller leaves them struggling in ninth, whilst Littletown maintain hopes of a top-two finish with four games in hand on their rivals. Lower Hopton ended a run of three defeats as they eased to a 7-2 victory over PFC. The visitors led 3-1 at half-time before pulling further clear after the break. Star man Kyle Watson struck a hat-trick, whilst Liam Royal hit a brace and Aaron Kennedy and Akeem Campbell found the back of the net. Efforts from Mohammed Zubair Khan and Ben Miller were not enough to prevent PFC from losing their sixth straight game, as they remain second from bottom. Elsewhere, third-placed Ryburn United kept pace with the rest of the top four as they defeated Steeton Reserves 3-1. George Turner, Chris Silkstone and Owen Wilkinson were all on target for Ryburn who won their fourth game in a row. Andy Howland’s second-half strike for Steeton proved not to be enough for the hosts.